Integrated Marketing PowerPoint templates, backgrounds Presentation slides, PPT Themes and Graphics. Turn your otherwise dull presentation into stunning one using our integrated marketing PowerPoint templates. Implement Integrating marketing PPT slide template in your designs and make a unified experience for your prospects to interact with your brand and organization. Our integrated marketing communication PowerPoint presentation templates assure your consistency in the market. Further, these lead to focus on promotional aspects effectively. Using these slide templates for your presentation spread your message to your customers and audience, and make them aware of your brand. These are marketing plans that enlarge beyond the traditional marketing developing a cohesive identity for your enterprise and brand. Let your audience trust you and reinforce their mind with your message using these creative integrated marketing communication PPT templates. It becomes a great source of advertisement for the presenter. An integrated planning PowerPoint slide templates assist to take innovative ideas and marketing resources to utilize strengths and maximize the impact. Look after your data and accountability behind the campaigns your organization is running with these PowerPoint slide diagrams. Also, efficiently aim towards target oriented audience. Count on these stunning integrated marketing presentation templates and stun the vast audience sitting in front. If you are looking for some free integrated marketing samples for your professional presentation, visit at our free download section and click download. All these PPT slide templates are customizable in shape, size and color. 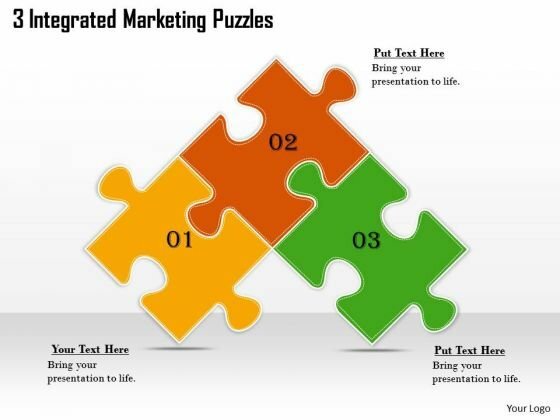 Document The Process On Our Timeline 3 Integrated Marketing Puzzles Powerpoint Templates. Make A Record Of Every Detail. Satiate Desires With Our Shapes Powerpoint Templates. Give Them All They Want And More.